Choose this option to fill in an arbitrary diameter. No standardized solution for these dimensions. If you are flexible in the diameter of the wall opening you could try the following: Test with different wall opening diameters, this may result in a solution with one or maybe two chains. Consult ourtechnical staff, to receive the optimum solution for your requirements. The specified diameter is no figure. The diameter of the wall opening must be bigger than the diameter of the medium pipe. 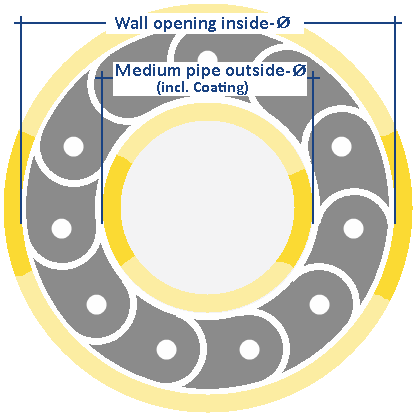 Specify the pipe diameter and the wall opening diameter. If necessary select thickness of the coating. Specify all diameters without scale units. Enter an integer greater than 0! $anzahl$ of sealing rings have been added to the shopping cart. There is no solution for this dimension. that it fits into the wall opening. Enter positive values without unit. Send us a message. You will receive a copy of the message to your email address. You will find the calculation result in the attachment. Create pdf document with your calculation result. You can either save the pdf file on your computer or print it or send it as email attachment. Create print preview of calculation result and send it to your printer.